A special broadcast of KNKX Connects to Skagit Valley, hosted by Ed Ronco and produced by Geoffrey Redick. For many, Skagit Valley is known for its annual Tulip Festival. And while the million-plus visitors who flock here every year is a remarkable part of the story, this area’s identity runs much deeper. All Things Considered host Ed Ronco and producer Geoffrey Redick take listeners inside the heart and soul of Skagit, from farmers helping each other thrive to vital programs for marginalized populations. :40 — First, we visit Bow Hill Blueberries, where Harley Soltes is hard at work juicing 180 pounds of thawed blueberries on his 5-acre farm. Most of the berries are frozen once they’re picked, a “value-added” approach, Soltes says. “And by freezing all the fruit first, it kind of ruptures the cell structure and helps release the juice the way we do it,” he said. 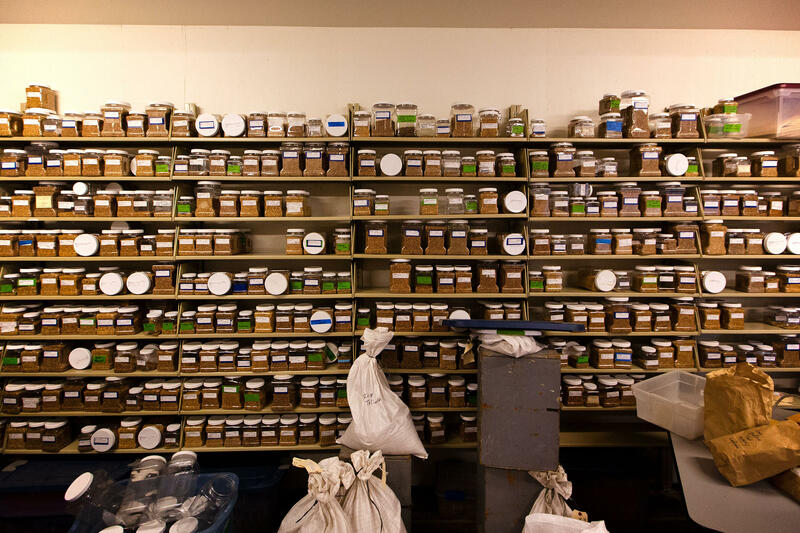 The farm is one of the founding members of the Puget Sound Food Hub, a farmer-owned cooperative with the goal of selling good food at a price that will keep farmers in business. 7:22 — Skagit Valley needs new farmers. The number of farmers is decreasing, and statewide some 70 percent of farmers are expected to retire in the next 20 years or so. But becoming a farmer can be a huge undertaking. One way people learn is through a nonprofit group called Viva Farms. 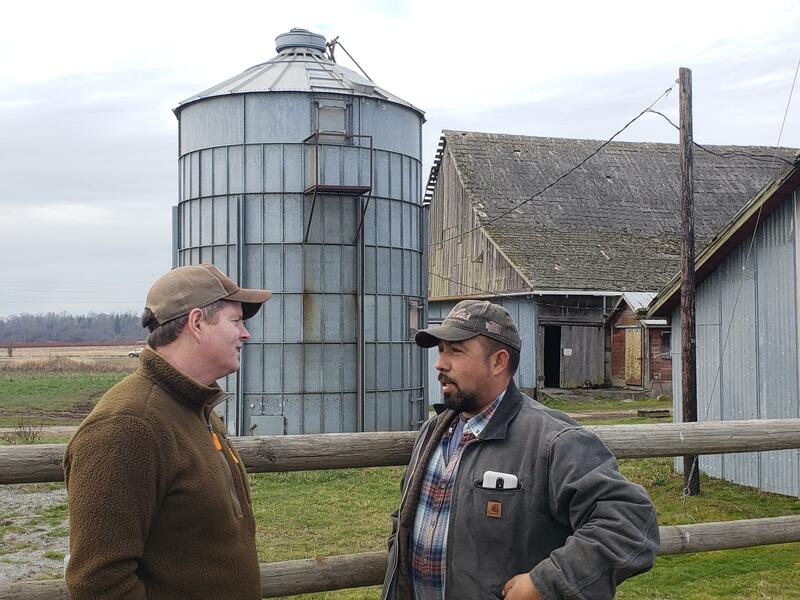 Michael Frazier, executive director of Viva Farms, talks to farmer and program participant Mauricio Soto (right). 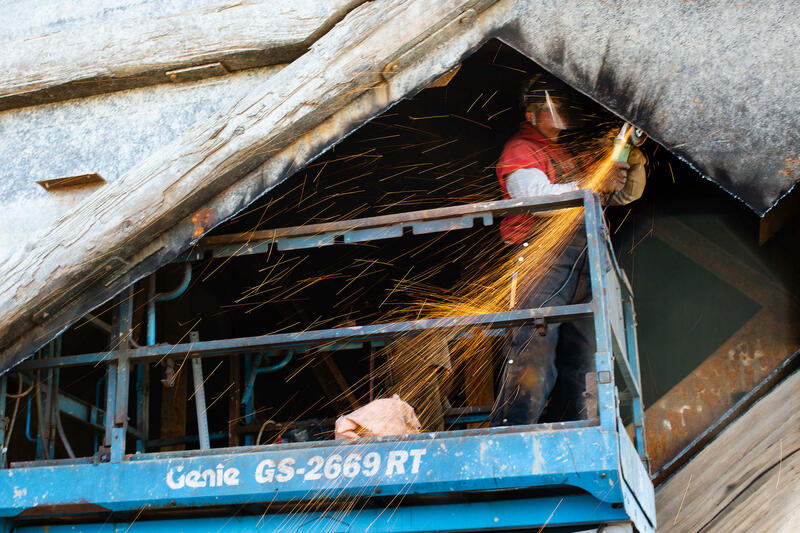 13:10 — It might surprise people to know that manufacturing is the top industry in Skagit Valley, given the large swaths of farmland. “I think that’s a common perception,” says John Sternlicht, CEO of the Economic Development Alliance of Skagit County. “I think there are even some people in Skagit County who might think first of agriculture and tulips when they think about us.” Ronco takes listeners to two advanced manufacturing businesses in the area. 20:08 — Next, KNKX Connects introduces listeners to Dr. Binay Shah. He’s an oncologist at PeaceHealth in Sedro-Woolley. But he’s also the founder of the Binaytara Foundation, which works to promote access to cancer care in Nepal and India, as well as health care reform in the United States. “We try to improve access to health care, access to cancer care, in the United States and in low-income countries such as Nepal and India,” Shah says. Interview with Dr. Binay Shah of PeaceHealth in Sedro-Woolley. 23:14 — Now that we’ve heard about manufacturing and health care, KNKX Connects introduces listeners to a very specific type of research. Washington State University operates a lab in Burlington where you can eat the experiments. It’s called the Bread Lab, and it looks for ways to improve upon wheat. Food commentator Nancy Leson joined producer Geoffrey Redick on a visit to the facility. Inside the Bread Lab in Skagit Valley. 32:10 — Then, we meet Matt Malyon, a chaplain and a writer who works with kids at the Skagit Valley Detention Center, as part of the program Underground Writing. Three and a half years after it first started, the program has grown into a podcast, a new book and workshops in five Skagit County locations. Extended interview with Matt Malyon of Underground Writing. 39:50 — Finally, environment reporter Bellamy Pailthorp meets up with aerial photographer John Scurlock and geologist John Riedel, who have become friends as they’ve collaborated in documenting the effects of climate change on Washington’s glaciers. 47:03 — Finally, a few moments with nature, listening to a flock of trumpeter swans on Fir Island. 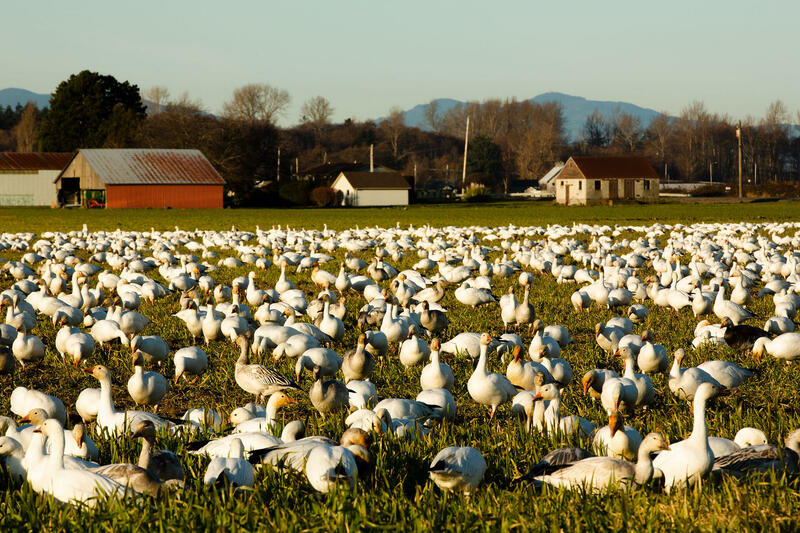 Trumpeter swans on Fir Island in Skagit County. KNKX Connects to Skagit Valley was the fifth iteration of our regional remote broadcasts. So far, we've visited Port Angeles, the Centralia-Chehalis area, Bellingham and Grays Harbor County. Visit knkx.org/connects to hear all our stories. Trails advocate and author Craig Romano hikes to the summit of Little Mountain with All Things Considered producer Geoffrey Redick. MOUNT VERNON, WASH. — KNKX Connects to Skagit County this Thursday, when All Things Considered broadcasts live from the Mount Vernon City Library. In this sneak peek of our show we meet Craig Romano, who is an award-winning guidebook author. He hiked to the summit of Little Mountain with producer Geoffrey Redick. 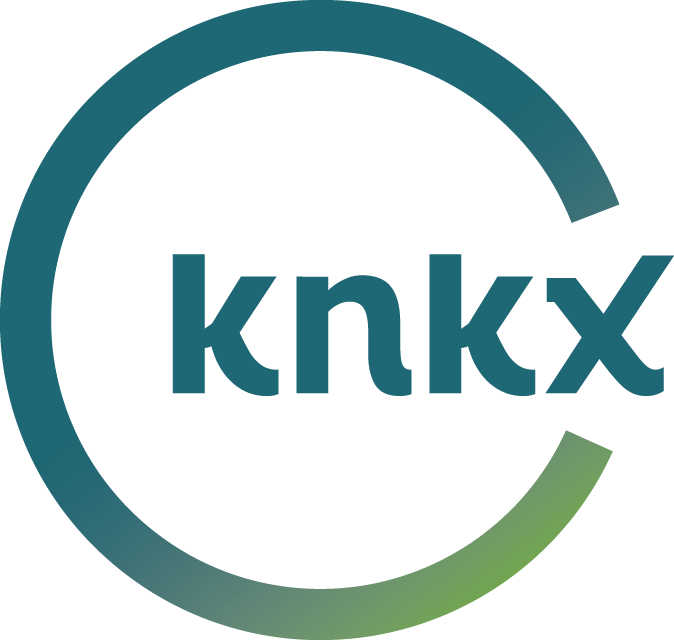 All Things Considered host Ed Ronco talks with Morning Edition host Kirsten Kendrick, previewing KNKX Connects to Skagit Valley. MOUNT VERNON, WASH. — Today, All Things Considered broadcasts from Mount Vernon City Library for KNKX Connects to Skagit Valley. Host Ed Ronco talked with Morning Edition host Kirsten Kendrick — live from Edgewater Park on the banks of the Skagit River — about some of the stories you’ll hear this afternoon 3-6 p.m.